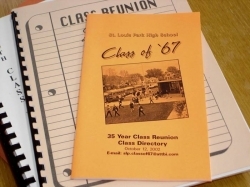 In some of the past reunions, we have printed a book containing a bio of most classmates. This is too expensive and is outdated quick, so we are providing this page to create a digital classmates bio book. Please know... this information IS secure and NOT available on the website, but you are able to contact anyone 'via email', who has posted their bio. So, please take a few minutes to update us with your comments and contact information, especially if you moved or changed your email address. Please add a current picture of yourself – it can be with your spouse, your dog, pet rock, what ever you prefer. Your 'Then' photo will be added later by the site administrator. Again please remember... no address or contact information is displayed on the website page, it is secure and only available for messages or announcements from the Reunion Committee. Thanks and enjoy catching up on everyone. The following pages by default are sorted by 'Last Name'. For better results, click on the down arrow to the right of the 'Sort By' and select 'Maiden Name'. It will be easier to find specific classmates. If you have trouble accessing your previous bio, send a message through the "Contact Us" page and we can assist with your username and password. From Patrick: I thought I would liven up this page with this photo. Can't believe we have been out of school for 40 years! Recently retired after 35 years with Pillsbury/General Mills (I was only going to work for a couple of years!) and am now thoroughly enjoying this new career. Have a 22 year old daughter who currently lives in St. Louis, Mo. Married Ron Flom (a '67 classmate) in 2003. From Ron: Have 2 children (in their 30's) and 4 beautiful grand children. I'll be joining my wife (and classmate) Carol (Swanson) in retirement from General Mills in December. Maybe then, I can finally be the rock star I wanted to be in High School! Okay, maybe I'll have to settle for being an aging amateur jazz drummer. From Al: "Glory days well they'll pass you by." I think Bruce Springsteen was right, especially as the 50th reunion is approaching. My glory days came well after high school. I got my B.A. and Ph.D. in psychology at the U of M. While at the U of M, I met kids I didn't know who also graduated in 1967 from St. Louis Park. Last year, I met a woman who works out at the Marsh with my wife... she also graduated in 1967 from Park. Although we had a large class. I think I must have lived under a rock or something from 1965 - 1967. I married a girl I met in college and we've been married for 45 years. We've lived in Edina for 34 years. We have two daughters. Our oldest daughter is 38. She graduated from Blake, Notre Dame, and Carlson School of Management. She is in strategic communications at 3M in Maplewood. My youngest daughter is 33. She graduated from Blake, Notre Dame, and the U of M Law School. She works for Faegre, Baker, Daniels in Minneapolis. She does patent litigation. I have a grandson, Riley, who will be 6 in August. He calls me YaYa. I was told that means grandma in Greek and Arabic. I am glad he recognizes my feminine side. I'm beginning my 30th year of self-employment. My company is Learning Masters. We develop Learning Systems for a variety of clients. I've done a lot of work for pharmaceutical and medicial device companies. For them, I've specialized in new product launches. My favorite was Prozac. Who doesn't love Prozac. For the last 5 years, my focus has been on eLearning design and development. I'm still working because I like what I do and I get paid to continuously learn new things. I look forward to the reunion and perhaps meeting new people. From Peter: Life has been good to me since high school. I just celebrated my 35th wedding anniversary to Connie Zweigbaum(class of 69). We have 3 wonderful kids. My oldest daughter is getting married in July. I have a dental practice in Robbinsdale, where I have been for almost 30 years. I find I enjoy working now more than I did years ago. I don't know if I will ever retire. If I am in town I would like to go to the reunion. I would like to thank the people on the committee for all their work. From Alison: I am semi-retired, but still working in Hardware Asset Management at US Bank-Richfield, where I love working with all their databases. We track all bank computer hardware in the U.S., Canada, and some foreign countries. I have one beautiful, smart daughter, Debbie, who lives in South Minneapolis with her wonderful husband, Steve and my two sweet grandkids, Steven, Jr. and Lily. Debbie graduated from the UW-Madison. She spent her junior year for 9 months in Quito, Ecuador, visiting Peru, the rain forest, the Galapagos, Indian villages, etc. I had the privilege of visiting her and her host family in Quito. She now works for General Mills in the customs brokerage department, where she uses her degree in Spanish communicating with the Mexicans. It will be exciting to see people from the Class of '67. I went to the ten-year reunion, but haven't made it back until this one. I am sad to see we lost so many class members. From Eugene: High School days so many years ago. I remember that being 40 was really old at that time. Now I my ready to go to our 40th Class Reunion and I don't feel that I am really that old at all. See you all at the reunion. From Howard: I moved from Minnesota to the Washington DC area in 1992, remarrying in 1995. I supervised an Infectious Diseases laboratory at the local VA Medical Center, retiring in 2015. My "now" picture was taken in July 2016 about 2 weeks after I went into cardiac arrest, was resuscitated, and had a quintuple bypass the following day. No great insights into the hereafter - still an atheist. I'm back doing everything I was doing pre-arrest including bike riding and pickleball. Looking forward to the 50th reunion. This is my second reunion that I will be attending. I cannot believe it has been 40 years, time has flown. I returned to Minnesota in 1989, after being gone for 20 years. I lived in California and Colorado. When I got divorced for the second time, I decided to move back to Minnesota. Some of you may see me everyday and not recognize me. I manage the drive thru Starbucks Coffee located on Minnetonka Blvd. and Inglewood yes, in St. Louis Park. Stop by and say hi. Looking forward to seeing everyone at our reunion. Hi everyone, I can't believe it is our 50th renion. Most of us are retired and enjoying our golden years. I moved to Cannon Falls about 3 years ago. Both my daughters still live in the cities. I have one grandbaby going to be 3 years old in August. I am in a long term relationship and very happy. I live on Lake Bylesby outside Cannon Falls, we have a pontoon boat and a RV so, I am a snowbird. I love to cook and sew and travel around the country. From CHRISTINE: 40 years have past? Seems like yesterday. I am looking forward to attending my first class reunion with Bill Terriquez (Class of '66). See you all there. From KEITH: MOVED BACK TO MPLS FROM FLORIDA IN 1989, NOT BECAUSE I MISSED THE WINTERS. I LEFT THE RECORD BUSINESS IN 1992 TO TAKE OVER THE FAMILY LIGHTING BUSINESS, AND NOW WAITING FOR SOME BOZO TO BUY ME OUT. HAVE A DAUGHTER WHO GOES TO UNIV. OF FLORIDA AND A SON WHO GRADUATES FROM HIGH SCHOOL NEXT YEAR. HOBBIES- GOLF, PLAYING POKER, AND WATCHING RABBITS EAT MY HASTAS. QUESTION- WHY DID CAROL ROSE DUMP ME IN 8TH GRADE? QUESTION- WHO WAS THE COMPUTER NERD WHO DESIGNED THIS WEB SITE- GREAT JOB. From Jim: I live in Burnsville with my wife of 31 years, Anne Wetterland (class of '70). Anne was disabled by a stroke four years ago, which has presented challenges, but we're doing OK. I'm in my 29th year as an attorney editor with Thomson West after practicing law for a few years in Preston, MN. I play softball and volleyball, and enjoy riding my two Harleys. Notice I'm wearing orange and black in the picture! Our son Jordan just turned 30, is engaged, and works as a project manager at Corporate Target. Dana, 27, is a dental hygienist in Prior Lake. Cara, 25, teaches second grade in the Prior Lake/Savage school district. I've enjoyed reading the entries of my classmates, and hope the rest of you will also contribute! From Stephen: Happily married for 33 years.Have lived in Edina for the past 27 years so I guess that makes me a cake eater. I have a son in Law School and a daughter in Medical school and another son getting married this fall. I have been in the bar and restaurant business for 37 years. I last attended our 10 year reunion. Does anyone know what our mascot was? Do we still have SAND? ?